The HCCM674M represents a breakthrough in camera design. At just a quarter of the size of a traditional camera, the HCCM674M produces superior quality pictures in variable and low-light conditions. Ideal for use in tight spaces, such as small dome housings and automated teller machines, the HCCM674M adapts to varying lighting conditions to ensure the highest picture quality. When the light level drops too low for accurate video identification in color, the camera switches automatically to black-and-white video for a cleaner picture. Camera setup is accomplished using an on-screen display. Menu navigation is simple and picture adjustments can be made in a matter of seconds with easy-touse push buttons on the back of the camera. 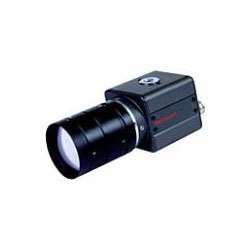 Features of the HCCM674M include a 1/3" 480,000-pixel, low-light CCD sensor with on-chip micro lenses and low-noise digital signal processing, backlight compensation, white balance, auto iris adjustment, 24-character text display, motion detection, privacy masking, and more. The Honeywell HCCM674M provides a cost-effective, discreet video solution in surveillance applications requiring high-resolution video in low-light conditions. These include general indoor surveillance applications in retail, financial, gaming, and other commercial markets.